If there’s two things even the closest of families can have a hard time agreeing on, they’re where to eat and what to watch. I can’t help you with the first one. But my family solved the movie night problem by ditching the whole concept and replacing it with video games. Movie night is a weekly tradition embraced by families all over the world. The idea is to bond over a shared cinematic experience with your loved ones. Unfortunately, in our house, the teenager and the toddler’s tastes in film don’t have much overlap – even if they do share the same attention span. It became apparent we were spending too much time trying to make movie night an enjoyable experience for everyone and not enough bonding, hanging out, and just generally decompressing from our always-online lives. This felt counter-productive so we set out to find a new entertainment medium for our family nights. Board games were right out of the question. Between our baby and the puppy (yes, we’re gluttons for punishment) there’s no way a dozen tiny plastic pieces were going to last through a gaming session. And after a long day’s work nobody except the toddler wants to do something requiring a lot of physical interaction — such as charades or Twister. This led us back to the TV. As it turns out, it’s pretty hard to find a form of entertainment that doesn’t require leaving the house, and that’s suitably fun for ages 2 to 42. Our eureka moment came when we happened to observe our toddler delightedly watching the teen play Minecraft. It kept their attention for more than 15 minutes — a new record! Family movie night is now family video game night – though we’re playing a different game. Minecraft, no offense to Mojang, isn’t a lot of fun to watch. And as anyone who’s ever tried to play a video game with a toddler around knows: you spend more time pausing the game to chase the baby than you do actually playing it. So we decided to go with a single-player game that everyone would enjoy watching – luckily we didn’t have the same trouble finding a title to play that we usually do to watch. 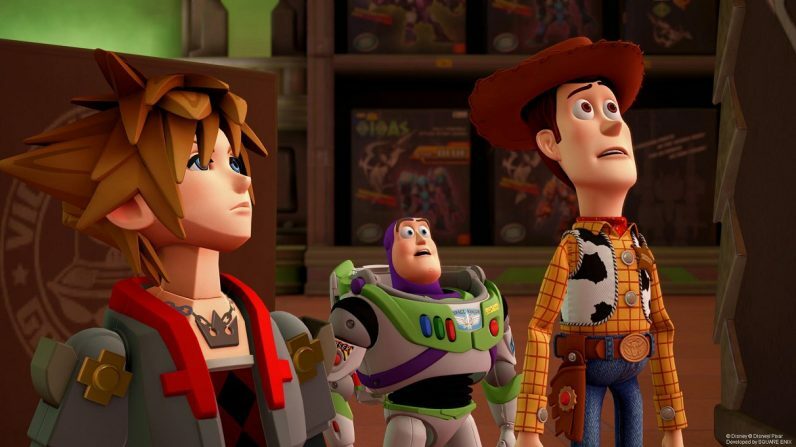 Kingdom Hearts III, developed by Square Enix, launched earlier this year (check out our review) and none of us had checked it out until now. My fiance and our teenager were practically giddy over the game — both of them are long time fans of the series. I’m a big fan of Square‘s games – and like many other parents I have a soft spot for Disney. Plus our toddler was hooked the moment Donald Duck started talking. I’ll admit I have next to no clue what’s going on with the plot. We play the game a few hours at a time, passing the controller as we talk non-stop through the game. Our teen is an oracle of knowledge of all things canon to the expansive world of Kingdom Hearts, but I still don’t know the difference between an Nobody and a Heartless. Disney‘s magic manages to shine through during each cut-scene however, and Square‘s mastery over the genre makes the game a treat for RPG fans – especially those partial to the Final Fantasy experience. Through playing KH3, we’ve found that the ‘talk during game-play, watch quietly during cut-scenes’ etiquette for family game night is more conducive to discussion and bonding than just silently munching popcorn in each other’s vicinity while a movie plays for 90 minutes. By nature, video games are more interactive than movies, but that includes the opportunity to interact with those around you too. We haven’t had any frustration over figuring out what we’re going to do on family night since we started playing video games. But, as we’re coming up on the end of KH3, there is some concern over what title we’ll pick next. Here’s hoping the Final Fantasy VII remake happens sooner rather than later.